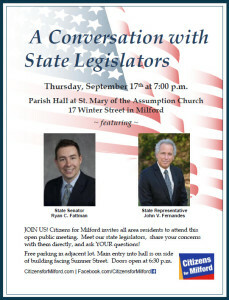 Citizens for Milford hosted “A Conversation with State Legislators” on Thursday, September 17th in the Parish Hall of Saint Mary of the Assumption Church in Milford. We thank State Representative John V. Fernandes and State Senator Ryan C. Fattman for joining us and answering citizens’ questions. Over 40 residents attended and posed a variety of questions, ranging from their respective opinions on the Trust Act to the status of a noise barrier along I-495 (a “lost cause”) to anticipated increases in homeowners insurance. We thank Milford TV for recording and broadcasting the meeting; the video appears below. Answers to some of the questions posed by residents to Rep. Fernandes and Senator Fattman that required more research, will be made available here soon. 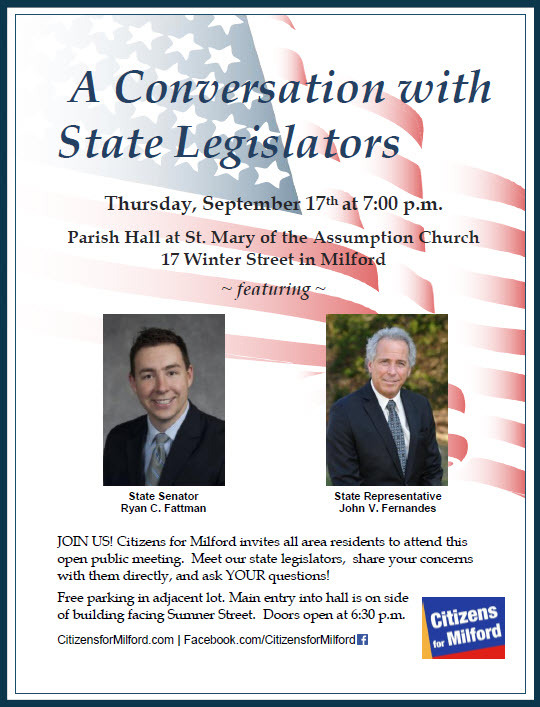 Read news coverage of this event in the October 2, 2015 edition of the Upton-Mendon Town Crier: “45 Residents Chat with Fattman, Fernandes” by Kevin Rudden. Selectman Bill Buckley thanks the legislators for their service to the community. To visit Representative Fernandes’ page, click here. To visit Senator Fattman’s page, click here.